Since going back to work I’ve relied heavily on make ahead meals that allow me to put homemade dishes on the table while spending my post-work time with the fam instead of prepping food. About once a month I’ve spent a full weekend afternoon making 4-5 freezer friendly meals that will get us 8-10 dinners. I’ll be sharing lots of make ahead meals this year but lasagna is a hearty go-to. 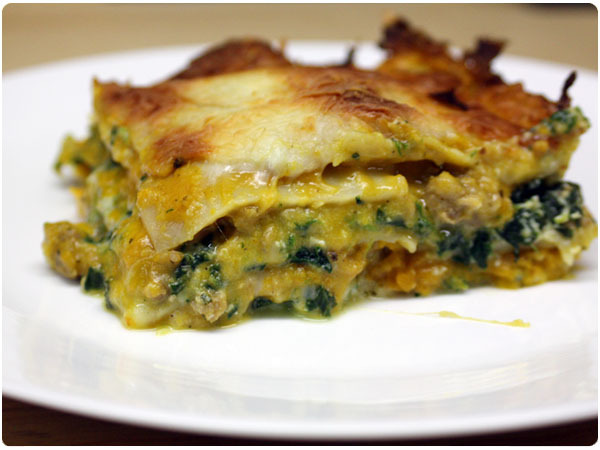 The Butternut Squash Pasta Sauce recipe I shared last week does double duty for me in this veggie-focused lasagna. I add Italian sausage at the request of my husband but you could easily skip it or substitute with portabellas for a completely vegetarian meal. In a large stockpot, boil enough water to cover the lasagna noodles. Once water comes to a boil, heavily salt water and add noodles, cooking according to package directions until al dente. Rinse with cold water to prevent sticking and set aside. Meanwhile, in a saute pan, cook italian sausage completely, about 8-10 minutes. In a medium bowl, combine egg, ricotta, 1/2 C parmesan and spinach. Season with salt and pepper. Trim a noodle to fit your pan using a kitchen shears. Use that noodle as a template to trim the rest of your noodles. You’ll have some small loose end pieces, which can be used for your middle layer of noodles without sacrificing the structure of the lasagna. Begin by layering three full, trimmed noodles in the bottom of each foil pan. Visually divide cheese and sausage into 4 portions in your head. Spread 1/4 of the cheese mixture on top of the noodles in both pans. Top with 1/4 of the sausage. Top with a layer of squash sauce. Next, sprinkle each pan with 1/3 C mozzarella cheese. Add another layer of noodles, using end pieces as needed. Repeat layers. Finally, top each pan with another layer of complete noodles, a thin layer of squash sauce and the remaining 1/3 C mozzarella. If freezing, trim a piece of parchment paper to fit the top of each pan and cover lasagna. Use two layers of heavy duty foil to wrap tightly around pan. If serving, bake at 400 for 50-60 minutes or until center is fully cooked and cheese topping is golden. 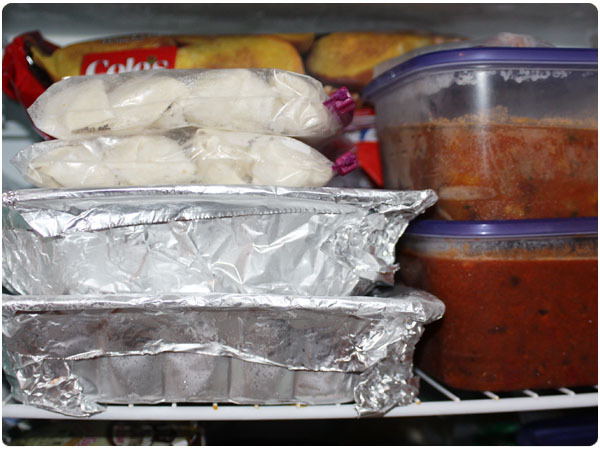 If freezing and serving, remove from freezer about 24 hrs before serving to partially thaw. Bake at 400 for 60-75 minutes. NOTE: I recommend setting your timer for 60 minutes and checking the temperature from there. Depending on how thawed your lasagna is your baking time will vary. Each pan serves 4 large servings.